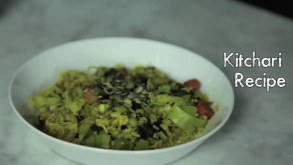 Kitchari is a vegan, gluten free, low fat meal that is good for everyone. It’s a tasty dish that is excellent for detoxing and is recommended by Ayurvedic Practitioners Vanesa Curutchet and Yasmin Fudakowska-Gow. Melt the ghee in a saucepan and add the muster seeds. As they pop add the coriander, cumin, turmeric and sauté them on low heat. Next add the basmati rice and split mung dhal and ginger. Stir to assure that all of the rice is coated with the spices. Cook for two minutes. Add the four cups of water. Bring the water to a boil and cook uncovered on medium heat until the water has evaporated and the rice and mung dhal are soft. This should take 30 to 40 minutes. Approximately 15 minutes before the rice is done, add in the seasonal vegetables. Garnish with sunflower sprouts and coriander to your liking. Enjoy! Vanesa Curutchet is one of the most sought after Ayurvedic practitioners in Quebec. She focuses on helping individuals find their balance and well-being. She has holistic yet modern approach that has caught the attention of the media. Vanesa has studied in California and Montreal to complete her extensive Ayurveda Practitioner certification. She now works out of her office in Westmount, Montreal continuing to provide the most comprehensive approach to health and wellness in French, English and Spanish. For more on Ayurvedic health visit Lifestylevideos.com or find Vanesa directly at vanesaayurveda.com. Yasmin Fudakowska-Gow has taught yoga for nearly 15 years. She is an accredited naturopath and Ayurveda practitioner, the producer of five yoga DVDs and the first woman to break the Guinness World Records™ for the longest yoga marathon lasting 32 hours. Yasmin’s roots are in Ashtanga Yoga, but her alignment based Vinyasa practices are tailored to specific therapeutic themes inspired by Ayurveda. She recently opened the Yasmin Yoga Loft, a beautiful teacher-run studio in the heart of Old Montreal that offers teacher training, workshops, an art gallery, catered dinners and other special events. To find Yasmin directly, visit yasminyoga.com.